The entry »Cultural heritage and the development of the Črni Vrh rural community« has been shortlisted in the Europa Nostra Awards. 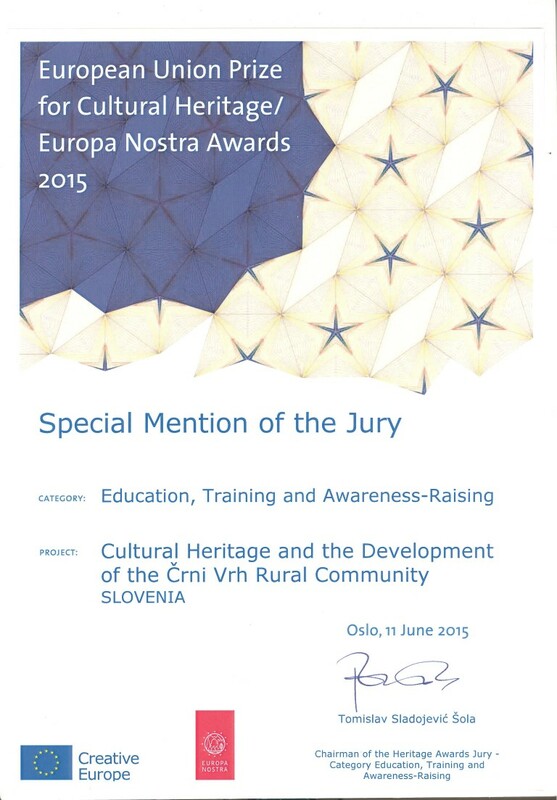 The team who worked in the pilot area at the Research Centre of the Slovenian Academy of Sciences and Arts is very honoured to have received a Special Mention of the Jury - Category Education, Training and Awareness-Raising at Europa Nostra. We are pleased that work and results of the project in the pilot area were recognised as an outstanding contribution to the conservation and enhancement of heritage. The winning entries were announced on European Commission and Europa Nostra Heritage Awards Ceremony, which was held at the Europa Nostra Annual Congress 2015 in Oslo, Norway.